at The Waterside Arts Centre, Sale. Of all Lionel Bart's Musicals, Oliver! is the only one to have survived, and continues to be popular with both amateur and professional companies. It's full of good tunes, it has a worthy storyline, it's based on a classic novel, it has children in it, it's family friendly, it has great characters, a great balance between tragedy and comedy - basically it has everything for an entertaining evening out at the theatre. No wonder then that this Musical is the one I have, I think, seen more times than any other. And so I must take my hat off to Sale Nomads and say a huge congratulations - it is the first time I have ever seen both boys and girls in the workhouse scene at the beginning. Yes, I know historically that boys and girls had separate lodgings but somehow I have never bought into girls pretending to be boys here and so having the girls in the ensemble actually being girls and not boys was a first for me, and an absolute delight. Well done. All the principal roles were well cast and all had a good grounding of their characters and characterisations, and a good pace was kept throughout the show. 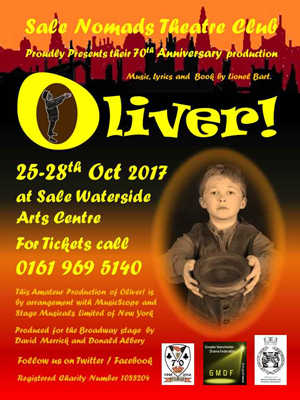 The young Oliver Twist himself, played here by a delightful young lad with a lovely stage presence and sonorous singing voice, Josh Moreton. And although Oliver is both the protagonist and the show's title, the story isn't really all about him, but instead uses his journey as a political and social comment on the state of the country, and so many of the characters that Oliver meets along his travel are actually personified allegories of a corrupt, violent and self-aggrandising government (not much has changed has it since Dickens first wrote Oliver Twist in 1837!). Back to this evening's show, and as previously mentioned, all principal roles were excellently cast and well thought through. However, I do believe a couple of them are worthy of a special mention. Peter McClafferty's Bill Sykes was suitably large, over-top-top and malevolent, and his moment of realisation after killing Nancy was excellently measured. Mr. Sowerberry was given just the right amount of obsequiousness by Derek Stuart-Cole (although I didn't understand the need for the white face make-up). A role which mostly gets completely overlooked, simply due to the fact that there is no plot developing or scripted reason for that character to actually exist at all, Holly Turner made a real and believable person out of the small role of Bet. I am given to understand that originally Bart had the intention of extending this role and developing a love / friendship interest between her and Oliver - however, all that is left of this now is their small duet together. However, the two characters which really made the show this evening were Domonique McClafferty as Nancy, a wonderful characterisation and great voice, making every nuance within her songs count; and a highly comedic but nevertheless fully grounded interpretation of the Jewish money-grabbing criminal Fagin, by the talented Richard Ross. With a live band under the stern direction of Peter England and the whole production directed by Diane Hutton then this is a lovely feel-good show for all the family to enjoy. If I might, nevertheless, just make two observations. First, bringing on the set for the Funeral Parlour during the I Shall Scream song was a little off-putting and diffusing focus, especially when the set included a lit candle; and second, perhaps if all the cast had London accents it would have set the time and place much firmer, as there were a couple of very northern tones in there unfortunately! Putting these things aside though, it was a very enjoyable presentation and congratulations to all involved.